He’s giving that island nation nearly as many days as his major visit to the US. Indicating how important all the flock are to this shepherd. Heading off to Washington D.C. to cover the Papal visit to the U.S. from there, I have no time to round up many good links I’ve saved to articles and posts covering Pope Francis in Cuba. In due time. But the best, in my humble opinion, is easily accessible in a few ways and places, mostly connected to British journalist, commentator and author Austen Ivereigh. Here’s one exception, a good post on Aleteia, of Pope Francis going off script to deliver what had been a prepared address. It occurred to Cardinal Jaime to speak a very uncomfortable word, extremely uncomfortable, that even goes against the cultural structure, so to speak, of the world. He said poverty. And he repeated it various times. I think that the Lord wanted us to hear it various times and to receive it in our hearts. The spirit of the world doesn’t know this word, doesn’t like it, hides it — not out of purity, but out of disdain. Read his remarks. This is who Francis is. This is where the world will find him, encounter him, learn from him if people are open to what he says. First, it helps to know who he is, and for that, Austen Ivereigh has given us the best (or certainly one of the very best) biographies, chronicles and profiles of this extraordinary successor of Peter. His book The Great Reformer: Francis and the Making of a Radical Pope is an extensive, deeply informed account of the framework around this unlikely pope and his ambitious program of reform, and “how this radical pope came to be”, as the jacket cover correctly claims. It is compelling. 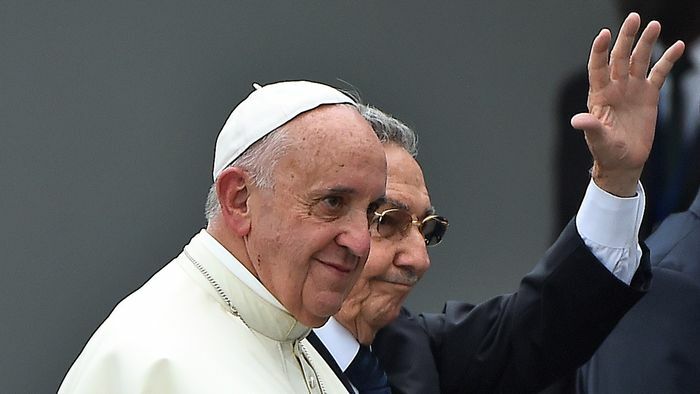 So is talking with Austen Ivereigh, which I did on radio last week from Havana, in anticipation of the Pope’s visit to Cuba, and again Monday, on the third day of events for Francis there, each with its own interesting facets. Monday’s conversation (9/21) with Austen was full, rich, engaging and compelling, as he covered the visit from beginning to the latest, fascinating encounter in Cuba Monday morning. Here’s one of his articles to go with the conversations, better to add context to this pope and his journeys to address, says Austen Ivereigh, the soul of both nations, Cuba and America. They aren’t that different. The countries and settings? Yes. The message Francis brings to both journeys? No.